All Out Effort Blog: Lifting Weights Will Make Women Huge! Lifting Weights Will Make Women Huge! But Sam, lifting weights will make me bigger and make me gain weight! I bulk easily! I don't want to look like a huge dude! So what's the science of thinking lifting weights make you bigger as opposed to eating more food making you bigger? 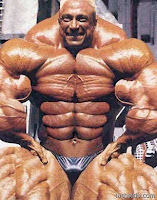 You lift weights, you breathe air, you inhale the air and it goes into your muscles inflating them, kind of like a balloon, except its not normal air, its heavy air so not only are you bigger, but you're also heavier? But then again I've found some people afraid to weigh themselves after a work out because somehow since they lifted weights, they will magically be heavier than prior to lifting. The molecules of the weights were absorbed through their hands and now they are heavier. If you actually follow the logic and see where it leads, you quickly see how illogical it really is. A lot of it stems from body builders, they lift weights and they are big and heavy. This is correlated and not cause and effect. The problem is people see body builders, professional and hobbyists at the gym, they aren't actually going home to see the massive amounts of food they are eating. You can't eat a very small amount of food, lift heavy, and get HUGE! Not even with unnatural means, like steroids. So without power eating, and possibly steroids, women will not look like a male power-lifter. Even then its difficult, that's why there is a billion dollar market dedicated to trying to help men "bulk." This is where common belief/popular belief and fact are not the same thing. There is also something else body builders do, they shed massive amounts of weights quickly to get competition ready (cutting cycle, bulking cycle is where they eat massive amounts of food to bulk), which also involves lifting weights, but they eat less. But as I mentioned previously, you see them on occasion at the gym, or on TV, you aren't actually following them around all year tracking their weight changes, nor did you study body building or do any research on the matter. So based on a few instances, we make assumptions. And assumptions become common myth. If I lift and eat a lot, I get big and muscular. If I eat a lot and don't lift or exercise, I get big and fat. Common denominator seems to be eating a lot, not the weights. Now if I eat less and lift more, I get lean and strong. Fact: Men have better times on endurance races than women. Fact: Men have an easier time losing weight than women. Why? They have more muscle. So why fear building muscle and only do cardio? When you can improve on both with more muscle.